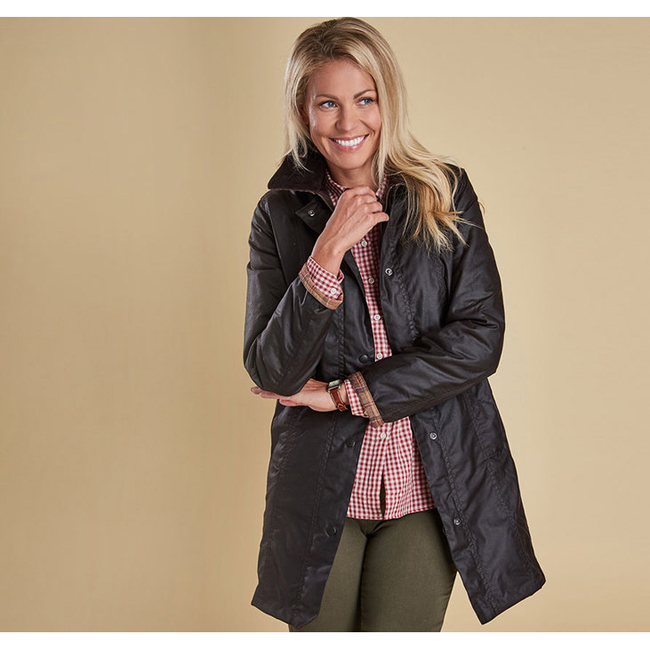 Crafted in Barbour’s signature Sylkoil waxed cotton, the Belsay is a traditional women's waxed jacket with a relaxed yet flattering shape. From the Country collection, this reliable jacket is a practical addition to any winter wardrobe, offering robust protection from the elements with its mediumweight outer, storm fly front and warm quilted lining. The longer length provides fuller coverage without restricting movement, thanks to the two-way zip and single back vent, while two generous pockets boast room to carry essentials and keep hands warm. Barbour’s tartan print trims the undercollar and inner cuffs, adding an authentic finishing touch. Designed to offer maximum versatility the Belsay is studded to take an optional hood, including the Classic Sylkoil Hood.